Procter & Gamble, Sky Ireland, Diageo, Vodafone Ireland and Reckitt Benckiser were the top five advertisers on Irish TV last year according to a TAM Ireland’s review of 2018. They were followed by Virgin Media, eir, McDonald’s, Aldi and L’Oreal. In terms of the categories that dominated TV advertising during 2018, telecoms, TV and online services took the top slot, followed by household, motors, insurance and entertainment & leisure. Meanwhile live sport continued to dominate the top 10 most watched programmes of 2018, according to TAM Ireland. While the most watched programme was RTÉ’s The Late Late Toy Show, which attracted over 1.5m viewers, Ireland’s epic Grand Slam showdown with England in the Six Nations – shown on Virgin Media Television – was the second most watched programme with 975,000 viewers. It was followed by the Ireland’s historic home-turf victory over the All Blacks in the Guinness Autumn Series which was shown on RTÉ as was the third most watched programme, England vs Croatia in the FIFA World Cup. The importance of sport to broadcasters in the overall rankings is borne out by the fact that 26 of the most watched programmes during 2018 were live matches, including hurling, GAA football as well as several Champions League matches. 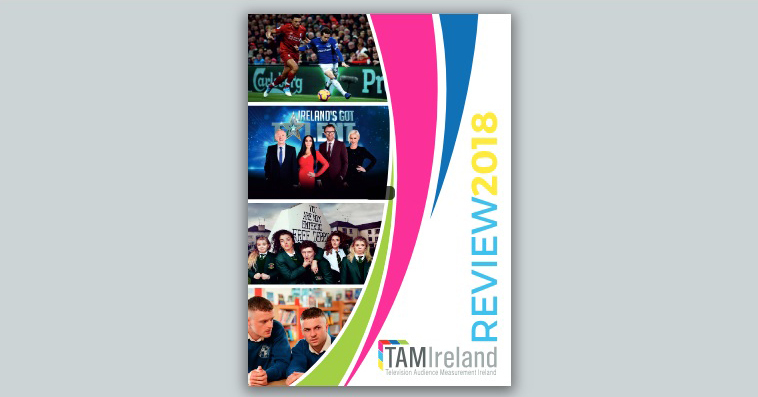 According to TAM Ireland, live TV remains fundamental to peoples viewing and 86% of TV was watched live in 2018. When it comes to the choice of devices on which TV is watched, the trusted TV set continues to dominate all other devices with an 85% penetration. It was followed by smartphones (6%) PC/laptop (5%), tablet (2%) and out-of-home viewing (2%). “It’s fantastic to see the power that Television continues to have in grabbing the nation’s attention. As programme choice continues to expand so too does our appetite for content. Over the last decade we have seen viewing time and occasions increase to consume this additional choice. TV is in a great place right now and dominates the media. 2019 should be a super TV viewing year,” says Jill McGrath, CEO of TAM Ireland.